Friendly and welcoming staff. Full amenities needed for stay. Mini bar available. Clean and tidy. Good location, S-Bahn access in 2 minutes. 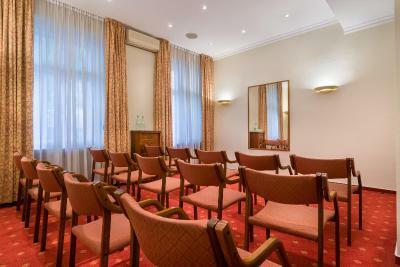 The location is conveniently near the train station as well as in the center of the city. The rooms are clean and room has safe. Window was pretty large. Beds were comfortable enough. The reception had cookies and a nice terrace. Breakfast was yummy! Eveything was very nice and clean. And location was good! Very comfortable room with balcony, nicely decorated. Speedy and stable internet. Everything was perfect, suff extremly helpful and kind. public transportion arround the corner. 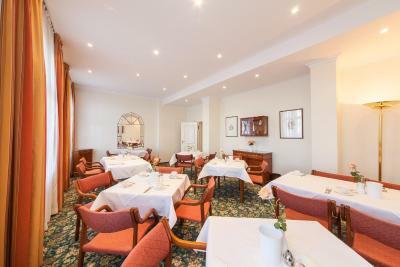 The Kronprinz is at a great location for the City Cube convention center (20 minutes walking or 15 minutes by S-bahn) and for Kurfurstendamm (2 minute walk), a street wth very good public transit access, many restaurants, cafes, and stores. The hotel lobby has been remodeled since I had previously stayed at this location. There is a nice patio for relaxing, having a drink, and chatting. The rooms are comfortable although a little dated. The bathroom facilities are modern and work well. Windows open for fresh air. Close to the S bahn, friendly and cooperative staff, delicious breakfast, nice evening ambient music in the lobby. Service at reception was excellent. Very friendly and helpful staff. Room was fantastic for the price had a small like sitting room off the main bedroom. Location was excellent S Bahn 5 minutes walk. 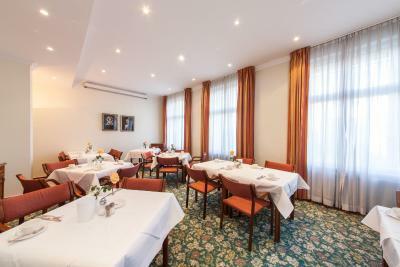 Novum Hotel Kronprinz Berlin This rating is a reflection of how the property compares to the industry standard when it comes to price, facilities and services available. It's based on a self-evaluation by the property. Use this rating to help choose your stay! Just 350 feet from the Kurfürstendamm boulevard, this historic, 4-star hotel in Berlin offers classical-style rooms, a terrace, and a 24-hour reception. Halensee S-Bahn Train Station is 650 feet away. 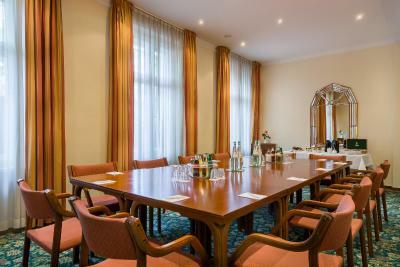 The nonsmoking Novum Hotel Kronprinz Berlin has spacious rooms with cable TV, mini-bar, and desk. Some include a balcony or bay window. There is a computer in the lobby where guests can access the internet for free. Trains run from Halensee S-Bahn Station to the Brandenburg Gate in 25 minutes. 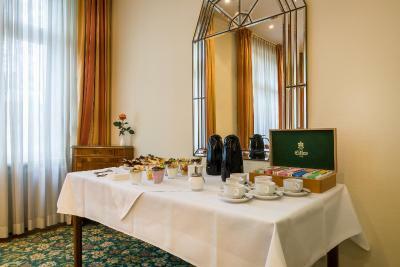 The Novum Hotel Kronprinz is just a 2-minute drive from the A100 motorway. 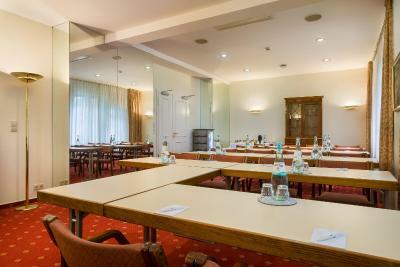 When would you like to stay at Novum Hotel Kronprinz Berlin? Spacious, classical-style room including a mini-bar. 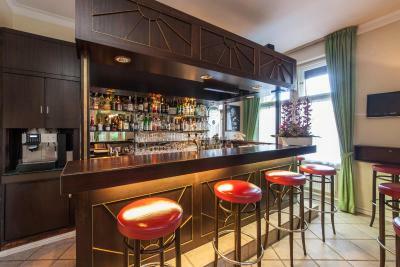 Large, classical-style room with safe, mini-bar and 2 telephones. This classic-style room features a separate living room, mini-bar and hairdryer in the bathroom. House Rules Novum Hotel Kronprinz Berlin takes special requests – add in the next step! Novum Hotel Kronprinz Berlin accepts these cards and reserves the right to temporarily hold an amount prior to arrival. Showers would perhaps require a bit of an update, but not a big deal. The railway disturbed our sleep. It was decent at best. Location quietness of area and cozy bedrooms. A pity that the bar didn't appear to be in use at all. Breakfast was good, plenty to choose from and good coffee. Not applicable. It was all nice. Easy to find. Close to train station. Easy walk to shops and restaurants. Staff very helpful and cheerful which made for a lovely stay. The area is neat and clean. I felt safe walking alone. It's quite a way out but fine if you're not in a hurry to get into the centre of the city. The breakfast was very good and the reception staff very friendly. The hotel was in a nice, quiet location within a minute's walk of the S-Bahn station at Halensee. Excellent value for money.